Led by the Holy Spirit, your strategic prayers can play a vital role in drawing a perimeter of protection around your family, home and community. This companion to INTERCESSORY PRAYER is an essential handbook for those who are ready to take on this critical role. 213 pages, from Regal. WANTED: mothers, fathers, laypeople and leaders to serve as watchmen-sentinels who stand watch on behalf of our families, our churches and our nation. After reading Watchman Prayer, readers who accept this assignment will be equipped to discern the direction of the Lord and the plans of the enemy. They will learn how, with the Holy Spirit's leading, anyone can pray a perimeter of protection around their loved ones, their city and the Church, and then unravel the schemes of the devil with strategic prayer. Join with Dutch Sheets and a host of others to take on this critical role and play a key part in the Church's ultimate victory. Everyone must be on the alert! 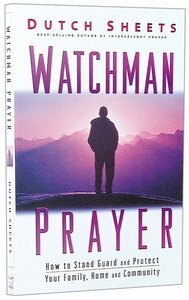 Read Watchman Prayer and learn everything you need to know about this sacred calling, a calling God is sending out to all of His people.